The Alfa Romeo Giulia Quadrifoglio has breathtaking performance, but tread carefully: Alfa's reliability is an unknown quantity. The 2017 Alfa Romeo Giulia Quadrifoglio is a driver's car to meet or beat the best in the class, with razor sharp steering, agile handling, and raucous power. Only reliability questions will hold it back. The 2017 Alfa Romeo Giulia is a compact four­-door sedan aimed at the BMW 3-Series, and the Quadrifoglio version is a BMW M3 fighter. The Quadrifoglio is the first car in an eight­-product assault scheduled for the next three years. Riding an all­-new rear­- and all­-wheel­-drive platform, the Giulia is offered in three models. The base and Ti models are powered by a turbocharged 2.0-liter 4-cylinder that puts out 280 horsepower and 306 pound-feet of torque. 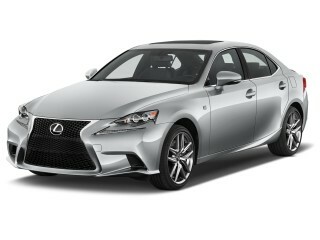 These models are offered with rear- or all-wheel drive. At the top of the lineup is the Giulia Quadrifoglio, which features a Ferrari-derived, twin­-turbocharged, all­-aluminum 2.9-liter V-6 that pumps out 505 hp and 443 lb-ft of torque, thanks in part to a whopping 35 psi of boost. It comes with both cylinder deactivation and stop/start technology. The lone transmission is an 8-speed automatic with paddle shifters. The Alfa DNA Pro drive-mode selector is standard, offering Advanced Efficiency, Natural, Dynamic, and, in the Quadrifoglio, Race modes. The modes adjust the brake and steering feel, as well as the engine, transmission, and throttle response. The Race mode triggers turbocharger overboost, opens the baffles of a two-mode exhaust system, and shuts off the electronic stability control. Alfa claims the Quadrifoglio offers best­-in­-class torsional rigidity, a best­-in­-class power­-to­-weight ratio of 7 pounds per horsepower, and a 50/50 front/rear weight balance. The mechanical bits support these claims. Carbon fiber is used for the driveshaft, hood, and roof, while the doors, fenders, front and rear subframes, mirrors, and suspension are aluminum components. An aluminum composite and plastic crossmember sheds pounds at the rear, while optional carbon ceramic brakes cut weight at all four corners. The Quadrifoglio also has adjustable dampers, mechanical torque vectoring, standard Brembo brakes, and 19-inch three-season Pirelli P Zero Corsa tires, 235/35s up front and 285/30s at the rear. Inside, the Giulia has supportive front seats, especially the Quadrifoglio, and decent rear seat space but small rear door openings. There is a smattering of quality materials, but the available infotainment system can be quite frustrating to use. All models come standard with leather upholstery, power-adjustable front seats with lumbar adjustment, bi-xenon headlights, LED daytime running lights, LED taillights, keyless ignition, remote starting, and a 7.0-inch color TFT instrument cluster display. Standard safety features include eight airbags, hill start assist, rear park assist, and a rearview camera. Also available are blind-spot monitors with rear cross-path detection, forward collision warning with emergency braking, adaptive cruise control with stop and go, lane departure warning with active lane control, and automatic high beams. The Alfa Romeo Giulia Quadrifoglio stands out among a crowd of homogeneous cars with its trefoil grille and serious, menacing stance. 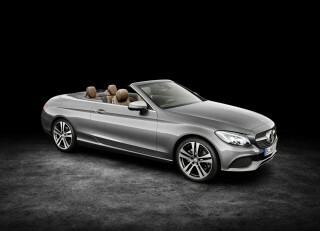 The body is draped over a long wheelbase, but short front and rear overhangs give it a tidy overall length. The familiar Alfa Romeo trefoil grille resides up front, along with adaptive bi-xenon headlights and a carbon fiber front active aero splitter that increases high­-speed downforce by as much as 220 pounds. The hood has a pair of air vents that conform to a V shape that begins with the dominant triangular portion of the trefoil grille. The front fenders of the Quadrifoglio feature green ­and­ white four-­leaf clovers. These sit above air extractors from which flow bold character lines that end at the rear door handles. 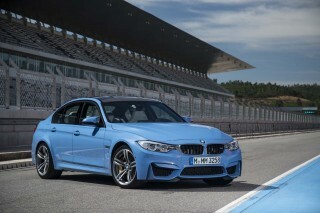 The rear fenders have powerful haunches that are reminiscent of the previous-­generation M3. The coefficient of drag is a fairly slippery 0.32. Overall, the look is unique and menacing, but from some angles the front view can appear too wide and slightly awkward. The lower portions of the front grille would also be better served by metal mesh than what looks like plastic. Inside, the look isn't quite as special. While some contrast stitching and carbon fiber trim dress it up, there isn't much design inspiration going on here. It's mostly just a monochromatic cockpit meant for the serious work of performance driving. Performance and feel are the 2017 Alfa Romeo Giulia Quadrifoglio's calling cards, providing quick lap times and the smiles that go with them. Hop in the 2017 Alfa Romeo Giulia Quadrifoglio and grip the small, thin steering wheel and you start to get the idea that this car means business. Fire up its rumbling, shrieking twin-turbocharged V-6 and start to turn the steering wheel, with its ultra quick 11.8:1 steering ratio, and you are soon sure of it. On the street, drivers will mostly want to use the DNA selector's Natural mode. Even in this mode, the 505-horsepower V-6 can be a bit high-strung, feeling jerky from a launch, and the 8-speed automatic transmission won't deliver the smoothest of shifts. The steering ratio is so quick that you'll have to recalibrate your hands to avoid twitchy motions. You may also experience a delay when getting back underway at stops due to a sometimes slow reacting stop/start feature. And the ride quality can be overly firm over rough pavement, though not so much so that it will liquefy your kidneys like the Alfa Romeo 4C can. The payoff is incredible performance. Opt for the Dynamic or Race modes, and the Quadrifoglio's reactions become immediate. The V-6 has plenty of grunt from a stop, but the turbos spool up and ramp it up even higher over 4,000 rpm. 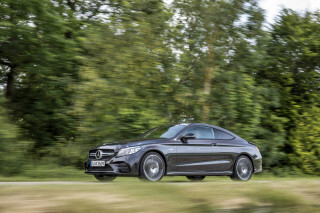 The 8-speed automatic delivers quick, sharp shifts and has massive steering column-mounted shift paddles that are easy to reach no matter where your hands are. That quick steering is a boon to high-speed cornering, and it becomes incredibly direct in the sportier modes. The ride quality becomes busier in these modes, too, but the car hunkers down through corners and reacts with seeming clairvoyance to driver inputs. But how does it handle? Quite well and with a pleasing neutral character. Drive it too hard into a corner and you can overcome the grip of the 245/35R19 front tires and cause the car to wash out instead of rotate. Control the entry speed, however, and the Quadrifoglio will rotate nicely, remaining pleasantly flat. Goose the throttle and the car will kick out the rear end. Stay on it and you can induce a glorious drift—if you're into that type of that thing. The Quadrifoglio has a brake-by-wire system that uses a rubber block to simulate pedal feel and an electronic sensor that detects pedal movement, then translates this to a computer signal that activates the brakes for you. While the brakes are plenty effective during performance driving, they can be touchy to modulate at low speeds. The steering may be quick, but it also doesn't offer much feel, and the lack of a manual transmission in a performance car like this is a slight to enthusiasts. As an end result of all this power and performance, the Quadrifoglio puts up impressive performance figures. The 0-60 mph run takes just 3.8 seconds, the top speed is a lofty 191 mph, and the car's handling and power came together to put up a 7:32 lap time at the Nürburgring. Even the high-performance Quadrifoglio has enough room for four adults—five in a pinch—with touches of premium interior materials. Alfa Romeo emphasizes that the Giulia's cabin is centered on the driver. The steering wheel is small and sporty, and, like the tiller of a Formula One car, it is home to the start button and several other controls. In the instrument panel resides a 7.0-inch driver information display, while the center of the dash gets an 8.8-inch display that can show real-time performance data and telemetry, as well as infotainment information. The center console houses a BMW iDrive-­style control knob as well as Alfa's DNA Pro mode selector. The infotainment system is almost laughably awkward to use. It always requires multiple clicks to change radio stations and the system doesn't stay on a presets screen or an all channels screen to let you switch easily between stations. The top of the puck-like controller also accepts finger-drawn inputs for letters and numbers. When inputting a navigation address, we had issues with random letters popping up as entered. It proved very frustrating. The system also lacks Apple CarPlay and Android Auto, which are becoming ubiquitous nowadays. As befits the class, a smattering of premium materials spruce up the cockpit, including carbon fiber, wood, and quality fabrics. To save weight, the available Sparco racing seats employ carbon fiber frames and more aggressive bolstering than the standard leather and Alcantara sport seats. In any form, the front seats are quite comfortable and they have enough bolstering to keep occupants in place during the aggressive driving that the Quadrifoglio encourages. The Giulia's space is surprisingly accommodating. The rear seat has enough room for a 6-footer to sit behind a 6-footer, and three across will fit in the back for short periods of time. The issue is getting in and out of the back; the door openings are small, so occupants have to twist their ankles to fit through the door gaps and into the footwells. The trunk is fairly large, though shallow, and in the name of structural rigidity, it doesn't offer a passthrough or split-folding rear seats to improve its cargo capacity. No official word from federal testers yet, but the IIHS has good things to say about the Alfa Romeo Giulia. Stay tuned. The 2017 Alfa Romeo Giulia comes standard with eight airbags, including side curtain airbags and driver and front passenger knee airbags. Also standard are hill start assist, rear park assist, and a rearview camera. The Ti model adds front parking sensors, while the Quadrifoglio gets blind-spot monitors and rear cross-traffic alert. Also available are forward collision warning with automatic emergency braking, adaptive cruise control, active lane control, and automatic high-beams. Giulias built after May of 2017 fitted with automatic emergency braking and automatic high-beams earn the IIHS Top Safety Pick+ award. What the performance and creature comforts gain, the comically awkward infotainment system takes away. 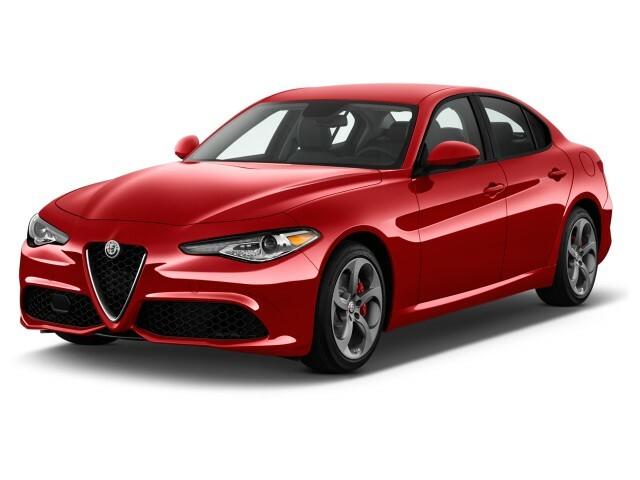 The 2017 Alfa Romeo Giulia base model comes standard with leather upholstery, 10-way power front seats with 4-way lumbar adjustment, bi-xenon headlights, LED daytime running lights, LED taillights, a rearview camera, rear park assist, keyless ignition, remote starting, and a 7.0-inch color TFT instrument cluster display. An available Sport Exterior package adds unique front and rear fascias, gloss black window trim surrounds, colored brake calipers, and 18-inch aluminum sport wheels. 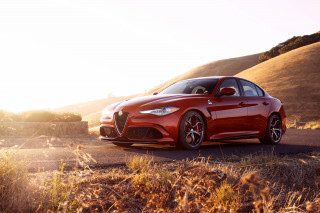 Opting for the Alfa Romeo Giulia Ti model brings wood interior accents, an 8.8-inch center screen, satellite radio, a heated steering wheel, heated front seats, and 18-inch wheels. The Ti is available with Sport and Lusso packages. The Lusso package includes Pieno Fiore Italian leather upholstery, 12-way power front seats with 4-way lumbar adjustment, leather-wrapped dash and upper door trim with accent stitching, wood trim in dark grey oak or light walnut, and a "luxury" steering wheel. The Sport package adds a sport leather-wrapped steering wheel; aluminum paddle shifters; 14-way front power sport leather seats with 4-way lumbar adjustment, power side bolsters, and manual thigh extenders; aggressive front and rear fascias; gloss black window trim surrounds; colored brake calipers; and 19-inch dark five-hole aluminum wheels. Those who want something even sportier should opt for the Ti Performance package, which adds a mechanical limited-slip differential, an adaptive performance suspension, and aluminum paddle shifters. 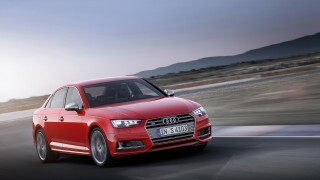 All-wheel drive is offered for the base and Ti models for an additional $2,000. The 2017 Alfa Romeo Giulia Quadrifoglio is a pure performance car. It comes with carbon fiber components for the roof, hood, side sill inserts, active aero front splitter, and rear spoiler. It also features an adjustable performance suspension, Brembo brakes, a Race mode for the DNA Pro system, and 19-inch aluminum wheels. Inside, it has carbon fiber trim, a leather-wrapped dash and doors with accent stitching, and 14-way leather front sport seats with 4-way lumbar adjustment. Base models are fairly fuel efficient, and even the high-powered Quadrifoglio doesn't gulp gas either. The 2017 Alfa Romeo Giulia and Giulia Ti models are rated by the EPA at a fairly thrifty 24 mpg city, 33 highway, 27 combined. Opt for all-wheel drive and that falls to 23/31/26 mpg. Go for the 505-horsepower Giulia Quadrifoglio and fuel economy predictably suffers. 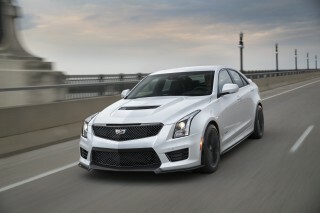 This twin-turbocharged V-6 drops the fuel economy to 17/24/20 mpg. Two of our testers got 20 or more mpg, though with quite a few highway miles.